Benchmarking: How your website is preforming compared to other websites of similar size. Here you can compare your metrics (ex: visits, page views, bounce reate, average time on site) against other websites. Bounce Rate: The percentage of visits on a website that result in an immediate exit. Click: The single instance of a user following a hyperlink to another page.. Conversion: This happens when a goal is completed. Cookie: Text data that is used to remember information from page to page and visit to visit. Cost-per-Click (CPC): The agreed-upon amount for each click someone makes on link (or ad) leading back to the advertisers site. This is also known as PPC. Cost-per-Thousand (CPM): The amount that an advertiser pays for the number of times their ad is seen by a consumer, regardless of a consumer’s action. Entry Page: A visitors first viewed page on a site. Exit Page: A visitors last viewed page on a site. Impression: The number of times an ad is displayed, whether it’s clicked or not. Each time the ad is displayed, it is counted as an impression. Key Performance Indicators (KPI): Typically kept in dashboards, KPI’s will tell you how the site is performing. Metrics: This defines what is going to be measured. Metrics are the parameters of quantitative assessment of a process that is going to be measured. Non-referrals: Visitors who come to your site by typing the domain into the search bar, using a bookmarked link or link that was emailed. Organic Search: A type of search where visitors find your site through unpaid listings. Outbound Links: Links on a your web page that lead to other web pages (different domain). Paid Traffic: Visitors who come to your website from paid campaigns. Page View: The number of times a visitor arrives on an individual page of your website. Every reload counts as an additional page view as well as a click to a different page. A visitor can have multiple page views. Path: The click pattern a visitor uses as they navigate through multiple pages. Referring Domain (ref domain): Other websites (ex: facebook.com, twitter.com, google.com) that send visitors to your site. Query: A question used to find answers about certain metrics. Time on Site: The average amount of time a vistior spends on your site within a specified time period. Top Landing Pages: The first pages that visitors come to, or land on when entering your site. Tracking Code: A code that is inserted to the body of an HTML page, you will find this code after the URL and it will start after a “?”. The tracking code is a paramater that you set and it will capture information about visits to a page. Traffic: Total number of visits to your site. Traffic Sources: This tells you where your traffic is coming from. Unique Visitor (UV, Uniques): The number of non-duplicated visitors that come to your site during a specified time period. Visitor: Someone who goes to a website. Visitor Session: The amount of time a vistior spends on your website. Visits: The number of times someone comes to your website. A unique visitor can have multiple visits. When is the best time to post on social media? This is a common question that most Social Media Managers are faced with. When you are creating your social media strategy, you want to make sure that you are optimizing posting times. For most small business owners and brands, your social media activity may be limited to about two posts a day. In some cases for social, less is more. In my experience, I have seen more success on Facebook by reducing post count and optimizing post time. If you are taking the time to create social posts, take the time to find a posting consistency that works for you. You want your posts going out during a peak time so that you can achieve maximum exposure. When you break down activity by site you will see that all social networks are different. What might be the best posting time for Facebook, could be the worst for Twitter. Facebook, Twitter and Pinterest are strongest in the afternoon, while Google+ and LinkedIn are strongest in the morning. Don’t forget about days, too. Not only do you want to create your posting schedule around time and network, but you want to make sure you look into optimizing days of the week. While it’s important to look at the best times to post, you need to to be looking at the worst times as well. This will ensure that you are not wasting your time by trying to be active during these periods. Here’s an infogrpahic that break’s down the best and worst times to post on social networks. Pinterest is one of the most popular social networks on the web, and has more than 48 million users, according to Mashable. PROFILE PICTURE: The great debate – Do I use a personal photo or a brand photo for my Pinterest profile? The answer is that it really depends on the situation. People tend to engage more with a brand if they know the face and name behind it. A headshot of the founder is a very powerful way to connect with your audience if you are a blogger, personal brand or service-based business. For those who want to increase brand awareness, you’ll want to to use your brand profile. Still not sure? Test them both out and see what works best for you. The most important thing to remember when selecting a profile picture is to make sure it’s a good one. You don’t want an image that is pixelated or has dim lighting. LOCATION: Local search is becoming more relevant so you want to make sure your about me section is updated with your current location. If you want to take it one step further, make a board about your location. Pin fun photos, landmarks or secret spots. Get involved in the Pinterest community! It’s important that you don’t just pin your own content. Make sure you are repinning, liking and commenting on other pins and boards. Try searching for content that is similar to yours and pin those images to your boards. If you repin a users content, they will be more likely to repin your content. Make sure you take the time to follow users who follow you. If someone is going to take the time to follow you, follow them back! You also want to follower influencers. Heat maps show that the top two rows are where visitors focus when they land on your page. Make sure you optimize these eight boards by placing your best boards here. You also want to have eye-catching board images. Spending some time sorting through your pins to find your favorite images for your boards. Focused boards can help to create a lifestyle around your brand. Get creative with your titles and pick interesting topics. Don’t forget to add keywords in the description for better search-ability. You also do not want to create empty boards. Start with a few boards, then slowly create new boards and move content. You want to make sure that your boards look complete and full of content. According to the Tough Mudder website, “Tough Mudder is possible the toughest event on the planet.” After successful completing my first tough mudder I can completely I agree! I had been debating doing Tough Mudder for some time now and after much consideration, I signed up. I couldn’t pass up the opportunity to do Tough Mudder Mid-Atlantic because it was the first Tough Mudder to take place in two different states. 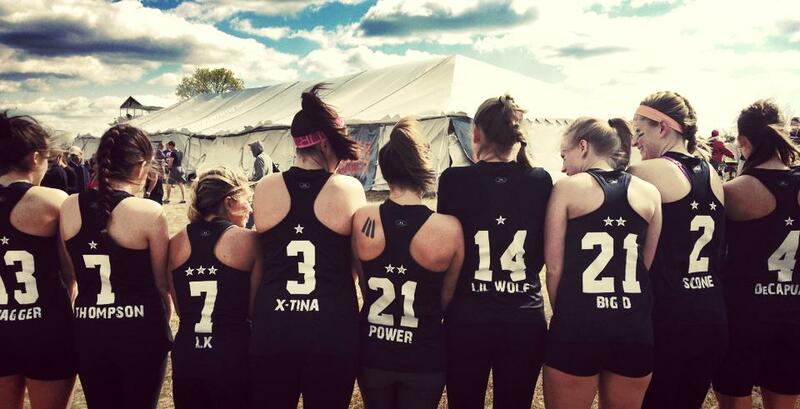 This year Mudder took place on a shooting range and training facility in Gerrardstown, West Virginia. After completing my first half marathon a month earlier, I was optimistic about the event. Physically I knew I could do it, but I knew that I would have to overcome my fear of heights. I had signed up for the event with a team of 17 and we had all agreed to help each other out. With a strong group, I knew that not only would we complete Mudder, but we would have a blast doing it. Tough Mudder is all about camaraderie and helping fellow mudders out along the way. Looking back on the event, I had fun. During the event, I have never felt so cold. The biggest con was the weather, it was cold and windy. Towards the end of the event my body was shaking because I was so cold. Despite the cold and the water events, the team pushed through and we finished. It felt so amazing to complete the event and earn my headband. Immediately after we finished I told myself this would be my first and last one, the next day our team had made plans for next year. I have to say, Tough Mudder does an amazing job marketing their event. They create this hype that the event is the toughest event on the planet so that you want to do it. One of the reasons I signed up, was to prove that I was able to complete this tough event. They make it sound so grueling that you are intrigued to sign up just to see what it’s really like. 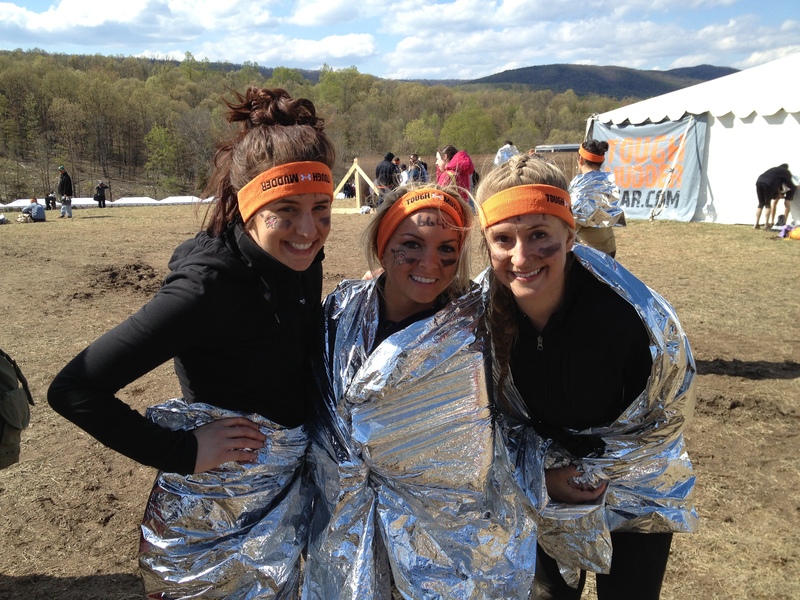 Once the event is over you can say, “I completed Tough Mudder” and that is a big deal. Tough Mudder also posts awesome pictures on Facebook and they create cool videos. When looking though the Facebook albums, their images and videos really showcase how tough the event is. Right after the event I couldn’t wait to tell my social network (free digital marketing right there). 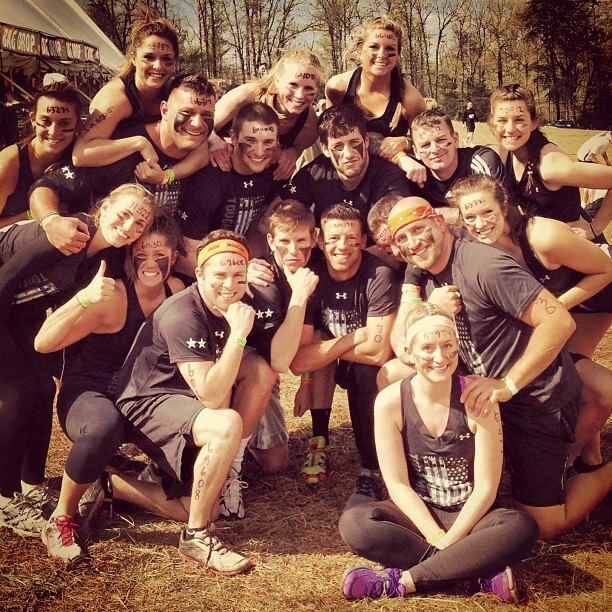 They really know what they are doing, props to the Tough Mudder team! Everyone wants more twitter followers. Here are some suggestions to help grow your fan base, for both your personal profile and your brand profile. According to Social Media Today, photos outperform text posts by 91%. Try sharing photos that you think are interesting and that your fans will want to share or click. With a new mobile update, the twitter mobile apps and twitter.com now show you more content in expanded tweets. Without even having to click your image link, users will now have a better chance of seeing your image when consuming your tweet via mobile. Here is an example of one of my most clicked tweets. 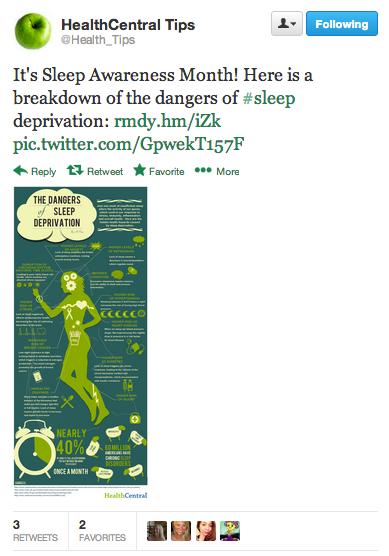 I used an infographic and I tied it with sleep awareness month. Try and engage your followers in your conversations. If you want your fans to engage with your page, you have to give them a small call to action. Ask them to retweet or reply to your tweets. One of my favorite ways to get users engaged in my tweets is to ask a short question in the beginning of my tweet. Give them a reason to connect with you. Show your fans you care and make sure you engage with them, twitter is not a one way street. If you want users to share your tweets, you need to share their content too. It is important to respond to your fans questions and retweet content that you like or think is relevant. Favoriting your followers tweets is another easy way to connect with them. If a brand RTs my tweets or favorites one of my tweets, I am much more likely to share their content on my page. With the fast pace of twitter, more and more new people are sharing their thoughts every day. Spend some time and follow people who are in your industry and who you think are interesting. Use the trends tool as well as the search bar to find some great influencers. It’s pretty simple, if you follow someone. they just might follow you back. Personally when a brand follow me, I follow them right back. I get excited knowing a brand wants to follow me. It is important to tag your contently wisely because this makes your tweets easier to find. Hashtags not only categorize your content, but it allows users to easily find previous tweets. If you are sending out what you think is a great tweet, add 1-2 hashtags to your post so users can find your tweets. I enjoy tagging my tweets because I want to reach as many people as possible. When I tag my content, I find that my reach and follower count goes up. Are you considering running a Facebook Sweepstakes? 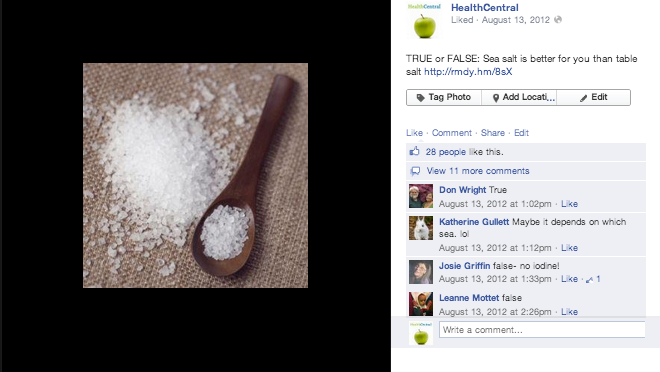 Here’s what a Facebook sweepstakes can and can’t do. Running a sweepstakes is an easy way to grow your Facebook fan base. If you give your fans a good prize, have a low barrier to enter and have engaging promotional posts, a sweepstakes can be beneficial to your Facebook page. All contests must be compliant with Facebook’s promotion guidelines. If you violate any of Facebook’s rules, Facebook will shut down your page and contest. Take a few minutes and review Facebook’s contest and promotion rules here. You also might want to speak with your legal representative about drafting up your rules before launching. Facebook requires businesses to run their contents on a third-party application. Tracking– does your app provide you with data? If you want people to enter your sweepstakes, you need to giveaway something cool. Spend a little extra money and giveaway something your fans will want to win. The more hoops you make your fans jump through to enter your sweepstakes, the bigger the drop off rate you will experience. Keep it simple, have your fans like your page and enter directly after. You can’t just run a sweepstakes; you need to get your fans and entrants to your sweepstakes. Before you launch, take some time and create a marketing plan. Launching your sweepstakes with everything in place the night before will make your life much easier. If you are running a long sweepstakes (1 month+), it is easy to forget about it. Make sure you do a last minute social push to remind your fans that your sweepstakes is about to end. You also want to make sure you remove your app from your Facebook tab. Don’t forget to properly contact your winner within the timeframe you had written in your rules. There is nothing worse than creating a Facebook post and have it receive no likes or comments. I’ve been there. After managing your brand Facebook page for a few months, you should have a good understanding of what your fans will click, like and comment on. If you are having a hard time understanding your audience, try asking them what they want you to post. You can do this by creating a status update or a poll. If you do ask your fans what they want to see, make sure to give them to post what they have requested. The Best way to get your fans to comment or like your post is by including a call to action. Including a call to action is a low level of effort for a big engagement return. 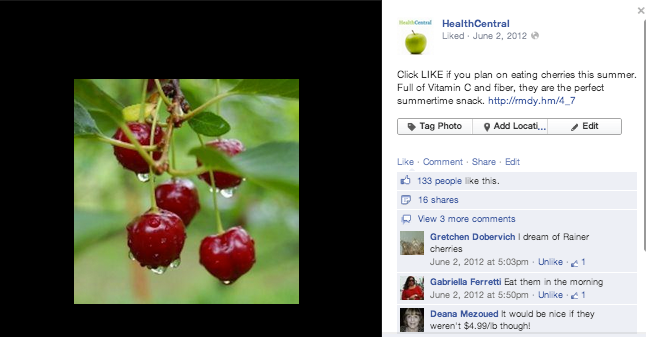 By asking fans to “LIKE” your post, you can increase your engagement by up to 5%. If you do ask a true or false question, don’t forget get to go back and provide your fans with the answer. Photos are the most shared post type by brands on Facebook. According to Context over Dogma, Photos are 5x more engaging than links. If you need likes and comments fast, post an image. 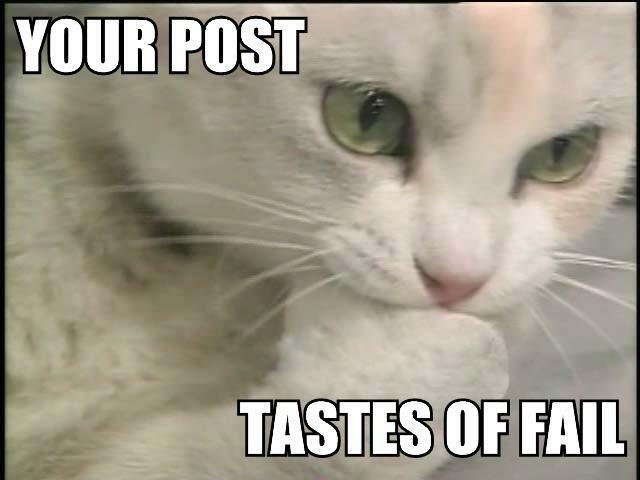 Photo posts are the most engaged with post type and reach the most people. EdgeRank likes visual content too. This means that your photo posts will get more visibility for your content on Facebook. Just because something has worked a few times, doesn’t mean you should continue to post the same thing over and over again. Your fans want to see you switch up your content and keep them wanting to like more. If you post similar content WOW, your engagement metrics could end up doing down because your fans are tired of the same thing. Get creative, find a new way to spin a piece of content and have fun creating new posts!